Last Thursday morning we left our hotel at 8 in the morning so that we could make the six-hour trek to the Amazon. I was a little nervous about the twisty roads and the drive up to 12,000 feet above sea level, so I took a Dramamine (or two) to prepare for the trip. We made it to the Amazon around 2 Thursday afternoon, and about 24 hours later, we made the trip back to Quito. So yes. We spent approximately 12 out of 36 hours on a bus. The good news is that I loved my fellow travelers, so it really was fun to hang out and visit and marvel over the gorgeous scenery together. And as an added bonus, I learned some things. I would be delighted to share some of those lessons at this juncture. 1. Opening the windows on an un-air conditioned bus is an excellent way to get some cool air moving around, especially in the mountains of Ecuador. 2. However, if you travel through Quito during rush hour, the smell of diesel fuel coming through said windows is somewhat overwhelming. 3. Also: if you should happen to be traveling with a manure truck either in front of or behind the bus, the combination of manure and diesel fumes will cause profound olfactory overload. 4. In the event that olfactory overload is combined with twisty roads and the sudden onset of car sickness, Melanie has some cat-like reflexes in terms of grabbing a plastic bag in the nick of time. 5. When one of my very best friends (see #4) gets car sick in Ecuador, I tend to say “I am so sorry” over and over again. 6. 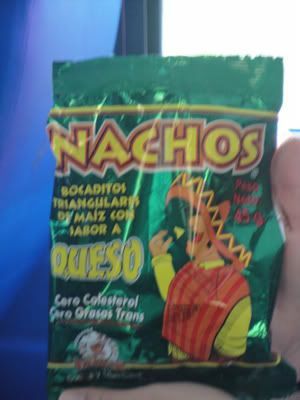 Kelly and I share a fascination with South American snack food products. 8. I found the Nachos to be way too heavy on the corn flavor and way too light on the cheese flavor. In fact, Amanda and I christened them “menos queso.” I was not a fan. 9. Ruffles in South America taste just like Ruffles in North America. 10. There is a certain comfort that goes along with Ruffles tasting like you expect them to taste. Especially when you’re a little homesick. And mildly car sick. 11. There is a South American snack called “Gudiz” that may be the most interesting food I have ever tried. 12. As best I could tell, Gudiz are pretty much Cheetos combined with Fruit Loops. 14. 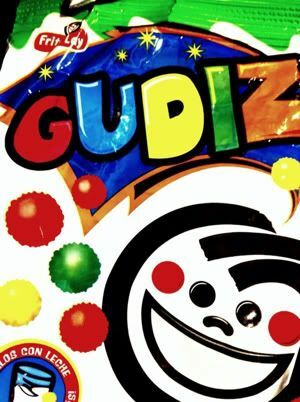 I never could figure out if Gudiz are a legitimate cereal or a snack food. Maybe they’re a snereal. 15. While Amanda, Kelly and I were discussing the merits of the various and sundry potato and/or corn chip options, I heard Shaun and Ann – who were sitting right behind us with Ann’s husband – discussing the book of Colossians. 16. I don’t know when I’ve ever felt more shallow. 17. But still. Did you see the part about Gudiz tasting like Cheetos AND Fruit Loops? 18. Ann looks at everything in God’s creation with contagious wonder. Around hour three of our bus trip, I realized that I could listen to her talk about, oh, TREES for pretty much the rest of my life. 19. Given a fairly wide open expanse of time, I apparently like to talk about writing A LOT. NOT THAT PEOPLE ASKED OR ANYTHING. I just start to offer all manner of unsolicited thoughts and feelings. Because THAT’S NOT ANNOYING. 20. The Ecuadorian countryside seems to bring out a strong desire (in me, at least) to listen to Watermark’s A Grateful People album. Because I listened to it over and over. And over. And over. And then I listened to it some more. All righty. I’d better get back to the business of settling back into my normal routine. Well. I have been to the jungle. OH YES MA’AM. I have been to the jungle. But sadly, Axl Rose was unavailable to welcome us there. And listen. I totally thought about making another map of our route from Quito to the Amazon, but I think that I’d need carpal-tunnel surgery after drawing that many swirly loop-to-loops in a row. It was sort of like riding a roller coaster, only it was a bus ride and way more bumpy and went all the way up to 12,000 feet above sea level and then lasted for five hours. Also, it would seem that double-striped roads are more of a suggestion in Ecuador than any sort of hard and fast rule. I’m grateful that our bus driver got us to the jungle and back again, mind you, but he executed several passing maneuvers that were Talladega-worthy. To the point that I almost put on some cut-offs and a tank top and sat on somebody’s shoulders. However, the good news is that once we made it off the raceway highway, the canoes and I did just fine. They were mercifully, blessedly covered, and given the level of sunshine and heat, those covers were a gift FROM THE SWEET LORD ABOVE. I told Melanie earlier today that if those canoes hadn’t been covered, the group would have had to leave me behind in the Amazon while I attempted to recover from a bout of the sun poisoning. We actually had to take a canoe to get to the place where we were staying, and when we finally reached our destination and climbed out onto the rocky beach, relief washed over me since the canoe ride was the part of the trip I’d been dreading the most. But then I looked at what was right in front of me, and I realized that there were a lot of steps. A lot of steps that we had to climb in order to get to the top of the bluff where the lodge was. And I’m not gonna lie, y’all. I was exhausted, I was hot, and I pretty much wanted to turn around and climb back in the canoe and curl up with my backpack and call it a night. But I climbed those steps. I also walked up a couple of ramps that, as best as I could tell, were built at about an 80 degree angle. We were all huffing and puffing as we tried to get to the top, and I wanted to look at Shaun and say, “I DO NOT REMEMBER SIGNING UP FOR ANY EXTREME HIKING.” Unfortunately, though, saying anything to Shaun would have required me to use precious oxygen that I was not of a mind to waste. What with trying to continue to breathe at a regular rate and all. After we ate supper and spent some time visiting, Melanie and I went back to our room to try to get some sleep before our big day today. I was totally unsure about how the whole sleep thing would work, especially since there was no air conditioning, not to mention that there were a great many squawk-y jungle animals living outside of our window. But get ready for some irony, my friends: I slept like a baby. I DID. It was my best night of sleep on this trip by far, and this morning I halfway felt like patting myself on the back and then giving myself some sort of merit badge. After breakfast we headed back to the canoes so that we could visit a couple of Compassion homes in a nearby village. It was an absolutely beautiful trip, and the river was so wide that there wasn’t any risk of snakes dropping out of trees and into our boat. It’s funny how your idea of what constitutes a SWEET MERCIFUL BLESSING FROM THE LORD ON HIGH changes when you’re outside of your normal comfort zone, isn’t it? Eventually we made it to the village, and after a roughly ten-minute hike we walked into an absolutely surreal setting. We were still in the middle of the jungle, but there were houses on stilts scattered around us. Each house was made of wood, with thatched roofs and window openings – but no screens. We split into groups, with Amanda, Kelly and Melanie going to the first house while Ann and I went to the second. And that’s where we met Jonathan. 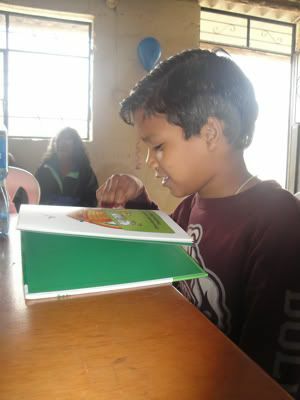 Jonathan is fifteen, a high school student, and thanks to his Compassion sponsorship, he is able to attend a nearby Compassion child development center. At first glance, Jonathan looks like a fairly typical teenager. He greeted us wearing gym shorts and a t-shirt, and while he was a little nervous about speaking to people he hadn’t met before, he had a kindness about him that caught me a little off-guard in the best possible way. And while it would make such a nice story if this were the part where I could tell you that Jonathan’s mother welcomed us inside their home, that his father showed us the places where he and Jonathan like to fish together late in the afternoon, that isn’t Jonathan’s story at all. Jonathan’s story is that his mother left his family when he was four years old. He’s only seen her once since then, but he’s heard that she has another family now. His father lived in the house for several years, but last year he decided to move to a nearby city in search of more work – and he didn’t want to take Jonathan with him. 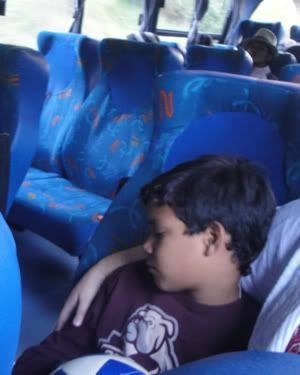 He opted to take “su hijo favorito,” Jonathan’s younger brother, instead. So every single day, Jonathan’s reality is that his mother left him and his father doesn’t want him. Every single day – at fifteen years old – Jonathan wakes up to an empty house. He goes to sleep in an empty house. He cooks, he cleans, and he tries to find ways to bring in some money. As Jonathan quietly shared bits and pieces of his story with us, tears welled up in my eyes. I started to worry that I was going to go into the ugly cry as I heard about his situation. But then – BUT THEN – I remembered the Hope that Compassion offers the kids that they serve. The pastors, staff members and volunteers look a child’s circumstances squarely in the eye, and they counter the despair with Truth. They know that there’s no wound in a child’s life that’s too big for Scripture to touch, to soothe, to heal. So yes, Jonathan has a tough story. But God has His hand all over that story through the ministry of Compassion in Jonathan’s local church. Jonathan, for lack of a better word, is broken. He is hurt. He feels rejected. He said that some nights, just to try to deal with the loneliness, he lies in his hammock and sings songs about God. He said that he looks forward to church every Sunday because it makes the days go by faster. He is a 15 year-old who has a whole lot of healing in front of him. But the Gospel – as I’ve heard my pastor say over and over and over again – the Gospel is good. 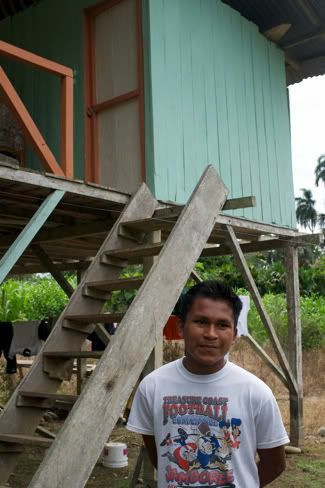 Compassion works through the local church to take the Gospel into remote places (like Jonathan’s village). The local church becomes a lifeline for kids like Jonathan because the Lord uses the local church – and the teaching there – to provide community, to provide family, and to show Jesus to children who might not know Him otherwise. We stayed at Jonathan’s house about 45 minutes, and right before we left, we gave him a bag of groceries. Jonathan had almost no food in his house – only three lemons, some salt and some oil. 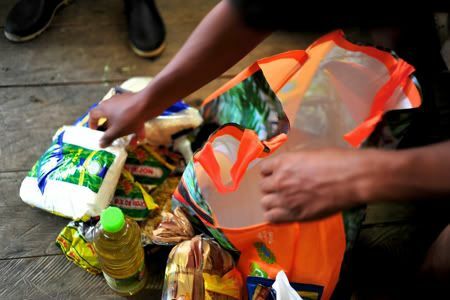 As soon as Ann handed him the shopping bag, he sat down on his bed and began pulling out every single item and placing it on the floor. After Jonathan finished unpacking the groceries, we asked if he’d like to travel with us to his Compassion child development center, which was just a little ways down the river (file the last part of that sentence under “things I never thought I’d say,” by the way). He said he wanted to go, so we all walked back through the jungle, got back on the canoe, and off we went. 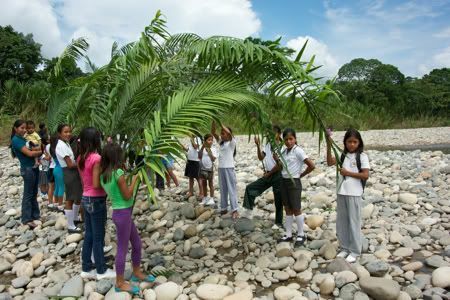 We traveled about ten minutes downstream, and as we made our final turn, we could see them in the distance: children standing on the shore and waving palm branches to welcome us. As we got closer, there was big ole lump in my throat when I realized that those palms, touching end to end, reminded me of the shape of a cathedral. Jonathan was the first one off of our canoe. He ran through the cathedral of palms. He ran into his community. And I will pray – and I hope you will pray – that the Lord uses His church to mend Jonathan’s brokenness, to speak Truth over the enemy’s lies, to make something beautiful from the ashes of a fractured family. And to show Jonathan how deeply, how completely He loves him. If you’d like to sponsor a child and be a part of being the church to a child in poverty, be sure to visit Compassion’s child sponsorship page. $38 a month makes a world of difference in the lives of kids all over the world. To read the rest of the blog posts from Ann, Amanda, Kelly and Melanie you can visit the Compassion Bloggers page. First of all, I wanted to show y’all these sweet faces from our visit to Cayambe on Tuesday. The children at the child development center were getting ready for an after school meal, and one of their leaders led them in a blessing. The two little boys at the end of the first table MAKE ME SO HAPPY. Second of all, we’re going to be “off the grid” for the next couple of days, and if you’ve been reading here longer than oh, say, TWO MINUTES, you no doubt understand that “off the grid” and I are not well-acquainted. However, Starbucks and I are very well-acquainted. WiFi and I are *likethis. * The thermostat in our hallway at home is so near and dear to me that I sometimes pat it as I walk by and have considered hanging a stocking for it at Christmas. But Thursday and most of Friday? OFF THE GRID. Our Compassion team is going to the Amazon jungle so that we can visit two Compassion child development centers in that neck of the woods (or that neck of the jungle, if you will), and as I have mentioned before, we’re going to have to ride in a canoe to get to some of the places we’re going. Just for the record, you should know that the number of times I’ve ridden in a canoe is ZERO POINT ZERO. Just for the record, you should know that the number of times I plan to ride in a canoe after Friday is ZERO POINT ZERO. I guess what I’m saying is there’s not going to be a sassy new “Outdoors” category over there in the sidebar anytime, well, EVER. But all that being said, I’m excited about what’s in store. I can’t wait to meet the Compassion kids in the Amazon, even though I have absolutely no idea what that will be like. One member of the Ecuador staff told us that the river is “high” and “there may be some rapids” and “the mud is so deep it will pull off your shoes,” so I think it’s pretty clear that there won’t be any grande peppermint mochas waiting on us when we climb in our canoes. 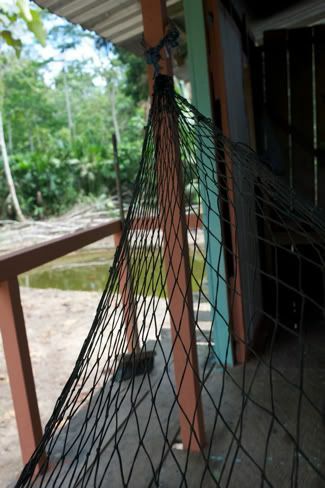 Regardless of what’s waiting on us, though, we are thrilled about being able to tell some of the Amazon kids’ stories. 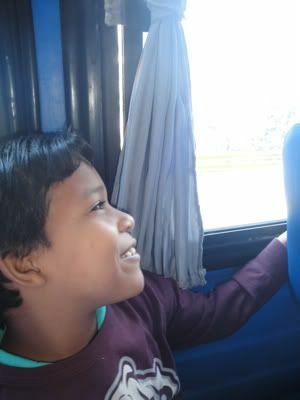 And more than anything, we want to help connect sponsors to the kids who need them so desperately. So if you’ll hang in there with our “off the grid” time for the next 24 hours, we’ll be back to regular posting on Friday. And before we leave on our big Amazon adventure, I just want to say this: if you haven’t already, please consider sponsoring a child through Compassion. For $38 a month, you can provide food, school supplies, school uniforms, health care and consistent exposure to the Hope of the Gospel for your sponsored child. Your Compassion sponsorship will shine Light into dark places; that child’s life – and, Lord willing, his or her family’s life – will be forever changed as a result. In Jesus’ name. Now if you’ll excuse me, I’m about to go get on a bus and prepare to meet my canoe-related destiny. I also need to prepare to meet the 12,000 foot elevation that is apparently part of our travel route, but something tells me that I’m going to miss that part of the festivities thanks to the wonders of Dramamine. I’m so grateful for y’all. I’ve known since Saturday that I was going to get to meet our sponsored child today. 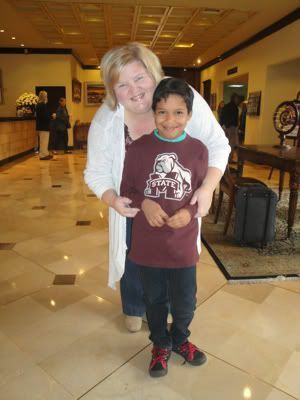 I was a little surprised that he and his mother would travel so far; they live on the coast, about five hours away from Quito, but the Ecuador Compassion office worked it out. So this morning, before I went down to the lobby, I double-checked Wilter’s backpack and made sure everything was in order: a couple of shirts, some books, a Beginner’s Bible in Spanish and English, candy, and a host of other little goodies. I took a deep breath, picked up the backpack, and headed to breakfast. After breakfast I was walking up to the lobby when somebody – Shaun, I think – sort of offhandedly mentioned that Wilter and his mama, Marta, would be spending the day with us. I transitioned from nervous to OH MY WORD I’M SICK AT MY STOMACH in about two seconds flat. Because what if he didn’t like me? What if I scared him? What if communication was too difficult since we speak different languages? What if he’d traveled five hours on a bus for the biggest let-down of his life? Granted, I’m a little tired and was probably giving way to a bout of the SHORT-TERM HYSTERIA, but I don’t think I’ve ever been more nervous than I was before I rounded the corner to where Wilter and his mama were waiting. My hands were shaking, even, and if you’re thinking, GRAB HOLD OF THE REINS, GLADYS, you may rest assured that I was repeating some variation of that exact same thing in my head. So I rounded the corner. And I saw Wilter sitting on a couch. And as our precious translator named Doris introduced us, that little eight-year old spitfire nearly knocked me over with the biggest smile and the biggest hug you’ve ever seen. And when I pulled away to say, “I am so happy to meet you. I am SO happy to meet you. We pray for you every single night.” – well, he threw those arms around my neck again and held tight for about 30 seconds. It was great, big, wide-open grace. And I soaked in every single bit of it. We moved over to the couch so that I could show him his backpack, and after a few minutes of conversation, I realized that Wilter’s personality is, oh, nearly identical to my little guy back home. My first clue was when I showed him a shirt that I brought him, and he couldn’t put it on fast enough. He threw it over his head – right on top of his bright green shirt – and he said, “WOW! WOW! WOW!” about fifteen times in a row. So I guess what I’m saying is that Wilter and I pretty much bonded right off the bat. 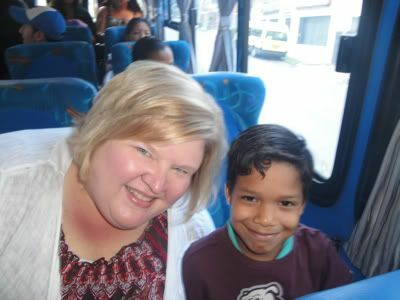 It was the sweetest gift, really, to meet a little boy in Ecuador who reminds me so much of my own, and I kept thinking, Well. The Lord just worked that out. He just worked out THAT WHOLE THING. Oh, don’t even pretend to be surprised that I gave him a Mississippi State shirt. YOU SHOULD EXPECT NO LESS. We hopped on the bus – Wilter, Marta, Wilter’s Compassion director, our translator and me – and we had ourselves a mighty fine time. Wilter and his mama had all sorts of questions about my family, about where I live, about what my favorite things are. I wanted to know all about them, too, and somehow a 40 minute bus ride passed by in no time at all. I know. He’s adorable. And his personality is even bigger than that smile. When we got to our first Child Development Center of the day, the pastor of the church spoke to us for a little while, and Wilter took that opportunity to read from his new Bible. After we visited a family’s home (more on that in another post), we walked back to a little room beside the church for crackers and Cokes. Marta and I started talking about what we like to cook for our families (like so many of us, Marta is forever trying to figure out what she can do with chicken), and she mentioned that Wilter’s absolute favorite meal is pollo frito. That would be fried chicken. And I think we all know that at that very moment, Wilter and I hit A WHOLE NEW LEVEL in our sponsor / child relationship. And y’all, I TOTALLY HAD. I’d said, “Me llamo pollo frito” instead of “Yo amo pollo frito,” and as a result I fear I have christened myself with an unfortunate but all too appropriate nickname. IT’S SO GOOD TO SPEND TODAY WITH YOU, WILTER. MY NAME IS FRIED CHICKEN. NOW LET US ENJOY THIS TIME TOGETHER. We eventually got back on the bus to travel to the second Child Development Center, and the people there were kind enough to serve us lunch (at another time we will talk about their LIFE CHANGING fried corn). Wilter sat down next to me, and one of the Compassion workers brought over a special treat for Wilter’s meal. I believe the Lord blessed us with a theme for our day together. The rest of the day was a happy blur. Wilter and Marta were so gracious, so warm, so affectionate, and the very best part is that my family is only at the beginning of our relationship with their family. Wilter is eight now (SMART AS A WHIP, I might add), and I can’t see what the Lord has in store for him at 10, 12, 15, 18 – I can’t wait to see how his years with Compassion impact him and his family. CANNOT. WAIT. Because the One who has called him is faithful. And He will do it. It was a big day. It was a full day. And by the end of the day – well, it was like Wilter and I had been a part of each other’s lives for a really long time. And do you know what I kept thinking? And we don’t need a Wilter so we can pat ourselves on the back and feel proud that we’re doing something to help a child in another country. We don’t need a Wilter so that we can put a picture on our refrigerator and check “global outreach” off of our church-related to-do lists. We need a Wilter to remind us that the Gospel is worth sacrifice. We need a Wilter to remind us that the church isn’t going to multiply through building campaigns. We need a Wilter to remind us that when it comes to discipleship, there’s no substitute for a one-to-one relationship. And I’m so thankful that we can all be a part of joining hands and hearts with the Wilters of the world. And if you happen to give yourself a sah-weet new nickname in the process, that’s just gravy. Or mashed potatoes and gravy, I should say. In the spirit of the perfect sponsorship side dish and all. Be sure to check in with Melanie, Kelly, Ann and Amanda on the Compassion Bloggers page! This morning I woke up COMPLETELY REFRESHED after four hours of sleep (disclaimer: the first part of this sentence is not at all true), and after I got out of bed and started getting dressed, I noticed that I was a wee bit – OH, HOW DO YOU SAY? – weak in the knees. 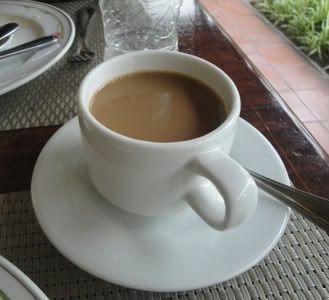 THANK YOU, ECUADOR, FOR YOUR COFFEE. It is magical and delicious. However, it is not magically delicious, because, well, that would be Lucky Charms. And then I had to quit talking for a few minutes because I wanted to sit back and really enjoy the experience of my entire face turning green. Kelly was having a similar reaction to the twistiness, and I thought that if she and I both were in such poor shape less than an hour into the trip, it did not bode well for the second half of our journey. 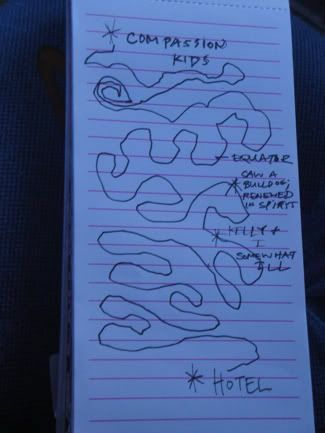 Maybe this would be a good time for me to show you a map of our route that I drew this afternoon. I feel that it might be a helpful visual aid. It’s totally true to scale. And you may have noticed that I marked a few milestones on the map. Perhaps I should elaborate. The first milestone is that Kelly and I were both somewhat ill (I believe I’ve mentioned that already). 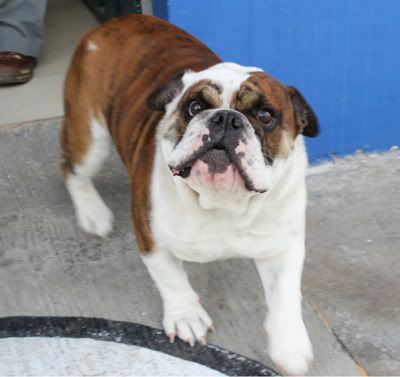 But the second milestone is that when we stopped at a convenience store for a restroom break, Kelly and I were the last two off of the bus (what with trying to stand up without wobbling and all), and when we stepped onto the parking lot, THERE WAS A BULLDOG THERE TO GREET US. And get this: I WAS WEARING MY MISSISSIPPI STATE RAIN JACKET. Listen. If I’d had my cowbell with me, it might have been the happiest moment of my entire life. The combination of the bulldog and the fresh air worked wonders on the car sickness, and when we hit the road again, we decided that a snack was in order. 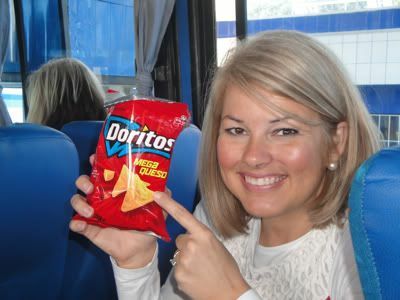 Kelly opted for the Ecuadorian Doritos, and when I saw the bag, there was no way that I wasn’t taking a picture. Mega Queso. If you ask me (which, granted, you didn’t), the world needs more Mega Queso. And I think I just may try to order some Mega Queso the next time I’m at Chuy’s. After the bulldog and the Mega Queso, I felt the day had already far exceeded my expectations, but then there was a little something called the Equator. We only had about two minutes to take in all the Equator goodness, so it was all very Griswold-esque. 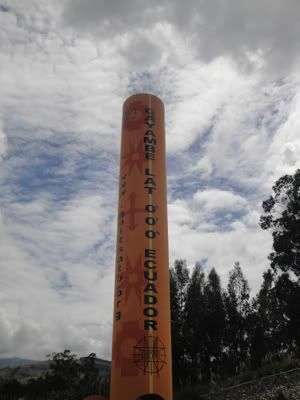 But still: THE EQUATOR. Not exactly a normal stop when I’m running my Monday afternoon errands at home, you know? Our next stop was Cayambe. And that, my friends, was the hands-down highlight of the day. No question at all. Cayambe is a beautiful little town situated on the edge of a mountain, and we went straight to the church that ministers to the kids at the Happy Face Child Development Center. It was so neat to hear how they’re serving their community, and they told us that out of the 400 kids they serve, about 100 of them don’t have sponsors yet. The church even started another branch of their Compassion project to serve an additional 100 kids at the top of the mountain. Many of those children still don’t have sponsors, so their expenses are covered through Compassion’s Unsponsored Children Fund. Their care doesn’t differ in any way, but they’re missing that one-to-one relationship with a sponsor. After we heard from the church’s pastor, we split into groups and traveled to three different parts of Cayambe. Kelly, Patricia and I rode in the back of a pick-up (OH YES MA’AM WE DID) to visit a precious family where three of the seven children are sponsored by Compassion. 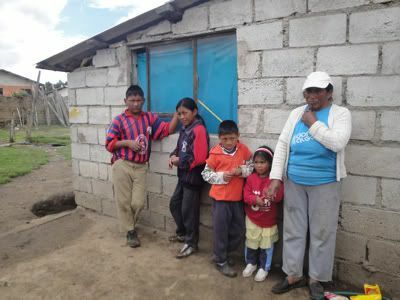 Compassion normally has a one child per family sponsorship policy, but the poverty in this part of Ecuador is so extreme, so profound, that they’ve made an exception to the general rule. 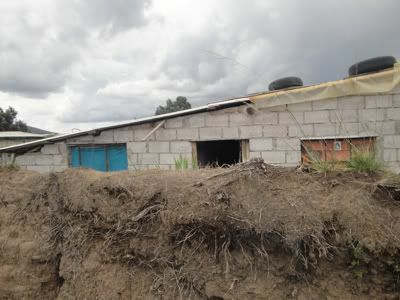 The nine members of this family live in a cinder block home with no indoor plumbing, and while they do have bedrooms, they don’t have mattresses. They sleep on pieces of plywood, and the kids’ rooms don’t have any lighting at all. Despite the difficulty of their circumstances, though, this family has hope. This family has Hope. The mama’s name is Rosa Maria (which I loved since I have a sister-in-law whose name is Rose Marie), and she told us about how Compassion offered counseling (through the local church) to her and her husband when they were going through a difficult time. She told us about how one of her sons – who doesn’t have a sponsor, by the way – was starting to act out and rebel at school, and the people at the Child Development Center stepped in to help. She told us about how she dreams that her children will have professional jobs one day, how she gets up at 4:30 every morning so that she can cook breakfast for them before they start walking to school at 5, how she would love it if each one of her children could have his or her own bed – and a mattress for that bed. She’s a mama who wants God’s best for her children. Just like you. Just like me. At one point during our visit we walked to the back of the home, where the family owns a small plot of land that’s adjacent their grandfather’s land. 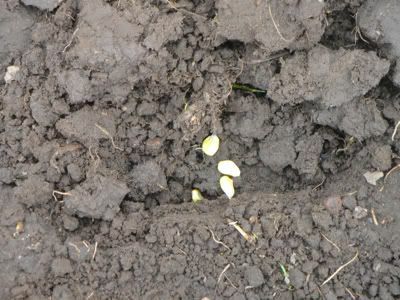 The soil was rich, the land was tilled – but the family hadn’t finished planting all of their seeds. A staff member from the Child Development Center asked us if we’d like to help, so Kelly, Patricia and I each grabbed a handful of corn. We’d turn over a section of soil, drop in four pieces of corn, then walk another foot and repeat the process. We did this over and over for about half an hour, moving from row to row, visiting with Rosa Maria and her children as we planted. And on the third or fourth row, I looked down at what we were doing, and I thought, This is it. THIS IS IT. Barring something totally unexpected, I’ll never witness the harvest of those seeds. I’m no less invested in the outcome just because I may not see it in person. It dawned on me that child sponsorship through Compassion works in a similar way. 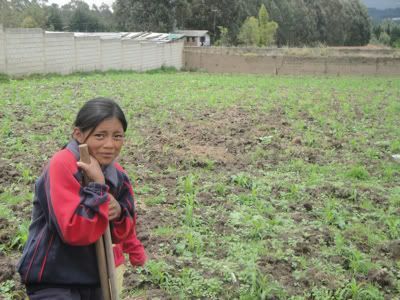 A sponsorship plants seeds in a child’s life – access to good medical care, provision for school supplies and uniforms, love and care from committed staff members at the local Child Development Center, healthy meals at the CDC several times a week – and then the local church waters those seeds through discipleship. The staff of the local church will share the Gospel with that child through their words and through their actions – and in all these things the Lord is working to gather a harvest of believers in the next generation. And while we may not see our sponsored child(ren) in person, we still get to have that one-to-one relationship with them. We get to write to them (and they write to us!). We get to invest in their lives, to share Jesus with them, to pray with them as they grow up into the men and women that God created them to be. Those seeds are for their good. And those seeds are for His glory. 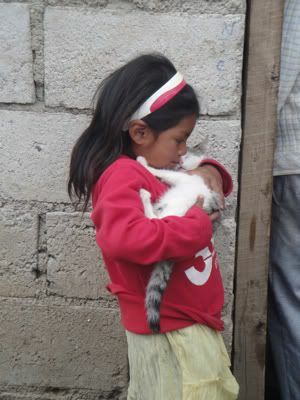 There are so many ways that you can sponsor a child through Compassion. You can sponsor a child at the Child Development Center we visited today (and based on what we saw today, the needs in that community are huge). 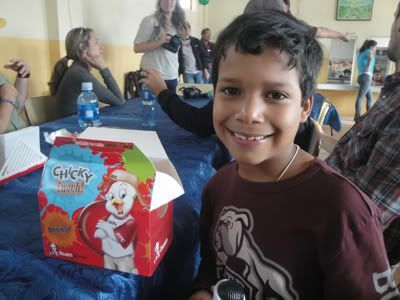 You can also sponsor a child in Ecuador who’s been waiting for a sponsor over six months (there are over 700 children in Ecuador who have been waiting that long). OR – you can sponsor a child in the country of your choice. Every single one of those children deserves someone who cares enough to plant the seeds of sponsorship into his or her life. And one day – Lord willing – there will be a harvest in that child’s life that will last for eternity. Be sure to check out the posts by the other bloggers on our team – see y’all tomorrow! All righty, everybody. We’re in Miami, and quite frankly I’m shocked that we haven’t seen Gloria Estefan yet. I hope that the rhythm didn’t get her. But odds are that if it hasn’t, it’s gonna. The flight from Birmingham to here was relatively uneventful with the exception of the fact that the heater was on full blast pretty much the whole way. It was basically like traveling in a rapidly moving convection oven, so as you can imagine I was refreshed as could be when we landed. Honestly, I think that the Lord was preparing me for the Amazon. It’ll probably be the same level of heat, only with some spiders and snakes thrown in for good measure. And also a canoe, but we won’t talk about that right now since my plan is to stay in deep denial about the whole canoe thing – at least until Friday when it’s, you know, inevitable. 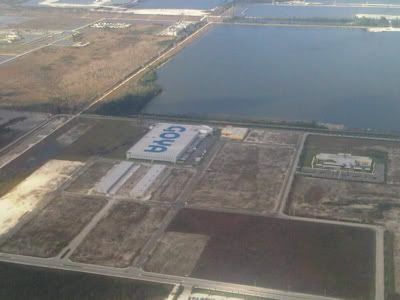 When we were about to land in Miami, I looked out of my window (and wondered what is it like out there, in a world where cool air circulates and the heat from the floor doesn’t burn the soles of your shoes? ), and I saw what I think must have been the Everglades. 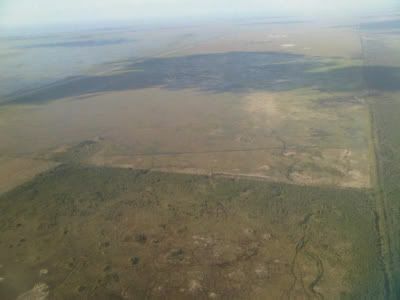 I’m assuming that it was the Everglades, at least, because it was very marshy and murky and seemingly quite alligator-y. It was also much, much larger than I expected. I always think of the Everglades as being a couple of oversized canals – really just big enough for Tubbs & Crockett to speed through the area in an airboat. The last of the big huge marshy area is in the far left of this picture. Try not to be impressed by my high quality photography that looks like something I would’ve taken with a disc camera back in 1984. OH! I LOVE THEIR BEANS! Hold on. We have to board our plane now. I’ll be back in a few hours. ALL RIGHTY. We’re in Quito now. We landed around midnight, which means that I need to shut down this computer and get some sleep. Our day starts bright and early tomorrow, and we can’t wait to share it with y’all! p.s. Sadly, I never did see Gloria Estefan at the Miami Airport. p.p.s. I don’t really know why I would see Gloria Estefan at the Miami Airport. p.p.p.s. I just thought it might be kicky and fun. p.p.p.p.s. And I bet the rhythm is still gonna get her.